Roger Stern: That I grew up on? Joe Edkin: Roger was actually a small guy so he could actually live on the comic. SK: Sure, yeah. I remember you said once that your first Spider-Man was #40. RS: 40 was the second part and in fact I commented on this talking with someone like you about Marvel: The Lost Generation. You know, it's like... well, we're coming in and we have a bunch of stuff earlier than this point. The first Marvel comic I actually bought myself was Amazing Spider-Man #40; it's the second part of a two-part revelation on the Green Goblin. I discovered Norman Osborn was the Green Goblin before I knew who the Green Goblin was! But it was so well done, I wanted to get those earlier issues. I had to move Heaven and Earth to find #39! There were no comic shops in those days. There were no back issues. It took forever to find that! And the important thing was that it was very well done. SK: So did you right after that go out and get 41 and 42 and just start on from there? RS: Oh, yeah. Actually I got 41. I think I missed 42. But I got 43 because distribution was still spotty in those days. It was like "Oh, no! What happened here?" So then I started haunting the newstands to make sure I wouldn't miss them. And I knew it took forever to find them. SK: One of the things I think I commented on briefly yesterday was how consistent your work has been over the years. RS: How consistent has it been? Has it been consistent? SK: One of the things that's always impressed me is that you've had your highs and lows obviously, and some stories are not as good as others, but they're all at least better than average. Even your worst ones are good stories. I was wondering if there's anything you actually do either specifically or not specifically that contributes to that or do you just try to do the best job you can? SK: And that's not something you really kept up with. RS: No, after I was fired from Marvel, I wasn't on the comp list anymore. There were like one or two titles I would follow, you know as creators change and everything, but yeah at least one or two series at Marvel. But not the whole run, I mean they were putting out hundreds of titles! JE: And some of them weren't very good. SK: Some of them? I mean, let's be honest here. RS: I was speaking to one of the editors at Marvel during that period he says, "You know, some of these stories aren't very good." I won't reveal his name because he still has a job. SK: I can guess just from the comments two or three that might've said that. RS: Probably all of them. SK: Probably all of them at one point or another, sure. Do you have a personal favorite, something like one particular one or one that stands out for you as something you're particularly proud of? RS: I've always said it's hard to pick to different favorite ones because I can say "OK, yeah, that story came out pretty well," but I also remember the deadlines, you know... waiting for the artist... "Oh, this is the one where he drew it out of order"... "Oh, this is the one where he left this character out and I had to cover for him." So it's easier for me to pick favorites of other people because I didn't have to work. I mean, when I was on Spider-Man... Usually when I leave a series, I don't really look at it for the next year or so because if it's not as good as the story I was doing, I'm mumbling "Oh, look at this." You know, and if it's better than the story I was doing, then I'm going "Oh, look at this! Geez!" But Spider-Man was fun because it was like Tom [DeFalco] and Ron [Frenz]: and they really captured what I was trying to capture at least I felt with Spider-Man and that turned out really good; I really enjoyed their stories. AND I didn't have to do the work! It was like "Hey, look! A great Spider-Man story and I didn't have to do a thing! Wow!" I didn't have to worry about deadlines, I just have to show up and there it is. Boy, what a deal! SK: I take it you're still a big fan of the medium and you read a lot of stuff just to read it? RS: Oh, yeah. Yeah, luckily I'm currently on both the DC and Marvel comp lists. RS: You know I don't keep all of them. Some of them go into a box to be given away at Halloween, but sorry, there are some things I just can't wait for. So I pick up some things at the comic shop because I don't want to wait for two or three weeks for the comps to come in. It's always stuff by people whose work I really like, like Kurt [Busiek]... Mark [Waid]... [John] Byrne... these guys, you know. Frank Miller, whatever he's doing that month. Whenever Scott McCloud comes out with something. The occasional Concrete series. Anything by Sergio [Aragones] and Mark [Evanier]. These guys. Whenever it comes out, "Whoa, I'm there." SK: Since you've been working in the business for so long, you've obviously worked with all kinds of artists. RS: Oh, yeah. I've been very lucky. I've been very, very lucky. SK: Are there any that stand out for whatever reason? You just really admire their work or they were a blast to work with? RS: I've got a huge list obviously. And John Buscema is far and away the best illustrator, but Sal [Buscmea, John's brother], I think, is a better cartoonist. He's actually a better storyteller. Not that there's anything wrong with John's storytelling, but Sal's stories are far better whereas John's illustration is better. But they're both great. I got to work with [Steve] Ditko on a few projects. That was great. Not only some of the stuff he came up with, but when he'd draw the stories I'd come up with. There's that Avengers Annual. I came up with this story with Arnim Zola. You know there's maybe only half a dozen guys in the business who can draw Arnim Zola and not have him seem silly. "He's actually not working for Marvel right now. Now John's busy and this guy I don't think... and, well, Golden: we'd like for it come out this year." I was talking to Tom DeFalco and he says, "You know... what about Ditko? Ditko would be great! And it'd be real sharp!" Ditko drew it and John [Byrne] had some time open up in his schedule, so he inked it. SK: Yeah, I remember that one. RS: It was just a joy; it was wonderful. It had some great stuff. SK: I think the thing that impressed me about that was how clearly all the creators' little bits came out. I remember that looking at each panel you could see this was very Ditko, but at the same time you could see this was definitely Byrne's inks over that. And at the same time, it was clearly a Roger Stern story, too. RS: It was great fun. It was a hoot, a real fun story. And, being in anthology books, I worked with Gil Kane once on a story... worked with Mike Golden a couple of times, and while it takes him a while to get stuff done, it's always gorgeous. You know, worked with Paul Smith. I've been very, very lucky working with a lot of great guys. Jackson and Byrne and Mark Wane (?) and all the guys on the Superman stuff. 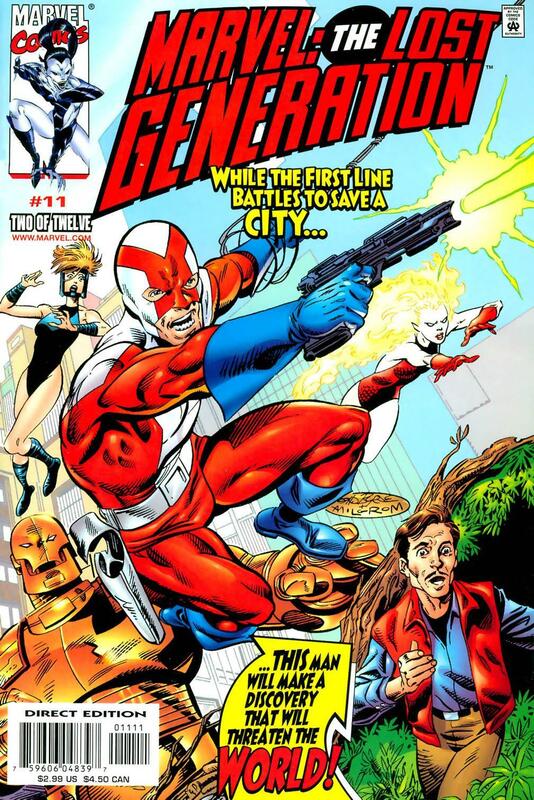 You know, I'd like to work with Ordway, but hey, he's a writer himself and he gets to work with Jerry Ordway! What a great deal! RS: Iron Man with Kurt. Yeah. SK: ... and Avengers Forever. RS: You know, of course, that was very research intensive. But it's not over, I can't say anything about at it the same time. Yeah. That was fun. With the Legionnaires, Carmela [Merlo, Roger's wife] was sort of assisting me. And as time went on she became more and more of an equal partner in the writing. And I wanted DC to give her a rate, you know, so you could have a real credit for her. And Casey Coleson was about to and then he went off staff and we spent an equal amount of time trying to convince Mike Mikavani (sp?) and then we were fired, so that went out the window. But that was to Casey's advantage: Carmela's a beginning writer, her rates would be much less than mine, you could've saved money on the book. But they're crazy. SK: How does that work differently with say, between Avengers Forever and Iron Man? You were doing the scripting on Iron Man, but doing more plot work on Avengers. RS: Here's what goes on with Avengers Forever. Kurt and I get on the phone. We toss stuff back and forth for an hour or so. I tape it, so we don't lose anything. We come up with the basic story, I transcribe it, go over it, put it in order, outline it, do the rough breakdown, e-mail it to Kurt. And he might tweak it, put in things we'd forgotten, or there's a trick in the meantime, and then it would go off to Carlos [Pacheco]. And then Kurt would script it. With Iron Man: same basic idea, except I did the final tweaks on the plot and then scripting. Sort of a mirror image. SK: And then you work in the same way with, I think John Byrne has a co-plot credit on Lost Generations? RS: Right. For that, we'd been talking about it for the past year so we had this broad outline. This is twelve issues... it occurs during this span of time... and all these things happened at these various times. And we talk over stuff, e-mail some timelines back and forth. He goes off and draws it. I get the pages. I'm making up names for the characters. "How about we call this guy Walkabout?" "Aw, good idea." And I do the script, he looks it over and if he has a problem, he calls up and we talk about it. And he's almost finished with drawing the second issue and now we're talking about the third issue. And we're already planning a few issues ahead because "We need to have a Nick Fury and Dr. Strange in a story" and all this business. We already know how the final issue is going to be. SK: So you're kind of just fleshing out the middle bits. RS: Yeah, it's very organic because as we go along and get to guys we really like, "Oh, we can do more of him in this issue." So we move things around a little. SK: So that's one of the problems of running backwards. RS: Exactly. Backwards in time. SK: So then you can introduce a character you like and then maybe do a genesis later. RS: Exactly, exactly. We're just making it harder on ourselves. Because we're stupid. JE: Do the whole thing as a haiku. RS: We're not that stupid! SK: I remember a comment by Mark Evanier at one point hated when Sergio would draw the Jester character in Groo because he always had to rhyme. SK: He was like, "Oh, God! Not another one of these!" 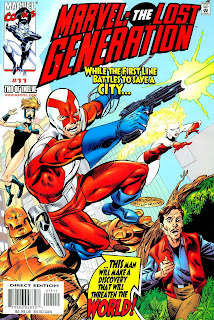 One thing I've noticed... well, I think it's pretty evident that a lot of stuff you're doing nowadays is very steeped in Marvel history: Lost Generations, Avengers Forever... that stuff. Is that more of a personal interest, you've just become more interested in seeing all of this stuff kind of mesh together or is that more of an editorial direction that you've just happen to have fallen in on these projects? RS: A little of both. It's this kind of thing where OK, I'm interested in this stuff and it does nominally well. You know, Marvel Universe got bowled over. SK: I enjoyed it though. I thought it was great. RS: I think I've met now everyone who bought it. JE: All seven of them? RS: They love it in Spain. Really. It's a huge hit in Spain. It's been collected in ten trade paperbacks. There's a Spanish publisher, Planeta, who's been republishing all my old Marvel stuff. Dr. Strange stuff, a couple volumes in trade paperback form. And the Avengers arc in paperback and also as reprints. They love them in Spain. Spain, dey love me dere! JE: You'll be elected president. You'll be the president. Then you can start a war with Mendelian and Don Rosa. Yeah. SK: I'll let that one lie. RS: In fact I've been invited to a convention in Madrid next year. I'm going to see if I can get them to reprint some of my DC stuff because I get royalties on DC foreign sales. SK: So they must be really loving Avengers Forever with Carlos working on that. He's a native, right? RS: Yes, he's very popular. I've gotten some very good response from online, e-mail from people in Spain. Which is good: if the industry collapses in America, I can always write for Spain. But I'm getting paid in pesos. I don't know what this means. SK: Do you have a different way you approach a series when you know it's going to be something like Lost Generations where you have a definite beginning, middle and end versus something like Spider-Man or the regular Avengers where it's just an ongoing where you do as much as you can until they fire you. RS: Oh, yeah. Because with an ongoing series, and Marvel Universe wasn't quite like this since it was done in arcs, I'm working on this story and I really need more room, "Well, I'll take an extra issue!" You know? Whereas with a finite series, I've got to wrap this up somehow. "I only have two issues to finish this! It's all hashed and mashed!" So it's a little more research and plot intensive to make sure everything works. The Hobgoblin Lives series. There were several ways we could have done that. I would've liked to have done like say, a five or six issue mini-series of twenty-two pages. I could put more red herrings in that way. But we just had thirty-two pages for three issues. "OK, I can work that way. I'll just pace it differently." And bring Spider-Man... In five issues, he wouldn't have been in every issue. With this, Spider-Man has to be in every issue. It all depends on the package and the format. But I'm fairly adaptable. I don't necessarily think that one format is superior to another, you just have to pace it differently. SK: And that's something you kind of do more advance work for on a mini-series. SK: You know you only have six or eight issues or whatever, so you've got more of an outline. RS: Exactly. Lost Generations, as I said, is more organic. We've got twelve issues. We know how it's going to end. Or "begin" as the case may be. And, so as we go through, we can move things around. We can emphasize a character more than we would've otherwise, if we like him and readers particularly like him. And in Generations, where each story is at least three years apart, if there's enough interest, we can always go back and revisit some of those characters from that time period or others. SK: You've got a little more flexibility there just by the way the series is designed. RS: A little more flexibility. Exactly. On the other hand, I'm also working on this Wonder Man/Beast mini-series. It's three issues. And so before I started, I outlined the entire thing because it has to end over here and there's just three issues. So things have to be plotted a little more tightly. To make sure that all the beats are in the right place. RS: I know what you're getting at. We're not nailing down the time periods on the early issues that come out. Or really the time that elapses between them. At the beginning of the series, we're seeing several characters towards the end of their careers. And at the end, we're seeing characters at the beginning of their careers. And some of those characters are going to come along, have a career, retire, maybe die, be injured or whatever and go away. Captain Hip and Sunshine are actually characters that sort of reinvent themselves a couple times during the book. For instance, we're dealing with some characters who are either long-lived or quasi-immortal and for those characters that aren't, we're being more vague about what time period they're in. So we have some characters like Captain Hip who may be long-lived and in a specific period and then something happened that we don't know. Whereas we have other characters that are already established like Nick Fury and Dr. Strange, who are very long-lived and for all intents and purposes don't age, to play sort of Greek chorus and appear in several stories. And it doesn't affect any Marvel stuff because they don't get any older. SK: Right. Makes things a lot easier. RS: Yeah. I've got to be very careful about that so that in 20 years these stories should basically work. Now the issues may be five years apart instead of three years apart. Or whatever. SK: So it's not quite as linear as a traditional mini-series. RS: The end of the series we'll be seeing more definite time references. They're definitely tied to a certain period in the Cold War and many characters don't necessarily survive in later years. But at the end, or the beginning as the case may be, of the series you're going to see characters... well, things happen to them. Some of them may be back, some get killed in modern day. Don't be... I caution readers not to be too quick to judge who dies or who doesn't in early issues. RS: Wonder Man! That's one his powers. To come back from the dead! SK: One of the things I've heard that kind hooks the lost generations together, since you're kind of jumping around between different time periods, is this Cassandra Locke character. RS: Yes. She's sort of a historian from what would be considered our future. She's from ahead of us and she's come back down the line to try to fill in some of these gaps and some of the histories. Some are going to disappear, some are going... some just don't exist on certain periods and she's just trying to find out what happened. RS: Yeah, she's a student historian. She's trying to find out what went on back here. And she's not completely a plot device, but she'll be handy in helping the readers find out what was going on in certain periods. "What do we know about this? How come no one remembers this?" "Well, the government hushed it up." You know? Or "No records were made. These records were lost." Where something happened. SK: OK. Does she have other angles to that then? It kind of seems real easy, since she's got a time machine and going through time anyway... it seems really hard in my mind, not to start to take advantage of that. RS: Oh, yeah. And also, she is going to turn up in some present-day Marvel stories on her way back. Just passing through. I know she's going appear in an upcoming issue of Amazing Spider-Man. SK: So stuff that you're not even working on. RS: Yeah. John just talked to Howard [Mackie] and says, "Hey, man, can Cassandra come through here?" So he says, "Sure" and so she pops up, "Whoop. Not far enough back." And I think John is going to do the same thing, having her in one his X-Men: Hidden Years stories. "Whoop. Not far enough back. Here we go." "Who was that?" SK: And that's something you could add at any time. SK: Ten years from now you're working on another Avengers story and just drop her in. RS: Exactly. That's the wonderful thing about time travel. You know? "Isn't he dead?" "Not yet. He will be later, but right now he's still around." In fact, there's a scene in the first Lost Generations -- I don't want to give away too much -- where she's talking to the Watcher. There's this terrible thing going on. And then she turns to the Watcher, "You've got to do something about this!" And he says, "That's not the way of my people. It's not under my control. I can't interfere." She says, "But you have... no, you haven't yet. Oh. I guess I've got to do something. I don't know what!" SK: Was she built in after you started working on this then or was it "OK, well, we need something to kind of tie all this together"? RS: She came in about mid-way into the series. John wanted to do a character who would try to get across to people that something important was going on, but they would ignore her. You know? And that evolved into this time travelling character. We know that something happens here because of something that happened over here at the tail end of it. And people ignore her because she's The Cassandra. She tells them things that're going to happen but no one listens to her. "Oh no!" And she keeps trying to get people to listen to her. "Listen to me! This is important!" "What're you talking about? Who the hell are you?" SK: That's actually about all I had. I appreciate your taking your time out. It's always a pleasure. RS: For the FF angle, there is at least one brief appearance by Reed Richards, looking a bit younger than he does now. SK: Well, he would have to be. OK, that sounds great. Thank you very much. I appreciate it. I've always been curious about the writing process on Lost Generations and especially on Avengers Forever, so this glimpse behind the curtain was much appreciated.